The very sight of the Six Bone ornaments, gifted to The Naropa, a scholar/saint, is said to confer blessings so great that the doors to the three lower realms – animal, hungry ghost, and hell – are closed. What else lies in store at the Naropa Festival, which is held in his memory? It was in a stark cold desert named Leh that I first heard of dakinis, the mythical creatures who carry the human soul into the sky. That is not their only job, though. They are also the spiritual muse, the guardians of the inner mysteries of the Self. I do not know what the dakinis look like. Perhaps pretty. Perhaps beatific. Sitting on a red carpet in the shadow of the 17th-century Hemis Monastery, I was listening to stories about them. Of how, about a thousand years ago, the dakinis gifted Six Bone Ornaments to an Indian scholar/saint called Naropa on the day he attained enlightenment. The Naropa (1016–1100), who became the Chancellor of Nalanda University but later left the materialistic world and his family for the path of enlightenment. At the age of 40, he met his guru, Tilopa, and attained enlightenment 12 years later. His teachings of the Six Yogas of Naropa are considered to be one of the fundamental pillars of the Vajrayana Buddhist tradition. It was for the five-day Naropa Festival that I had flown in to Leh. At 11,652 feet above sea level, my lungs should have been gasping for an ounce of extra oxygen. Instead, caught in the milling crowd of monks and nuns, the curious and the onlooker, my soul was packing piety. 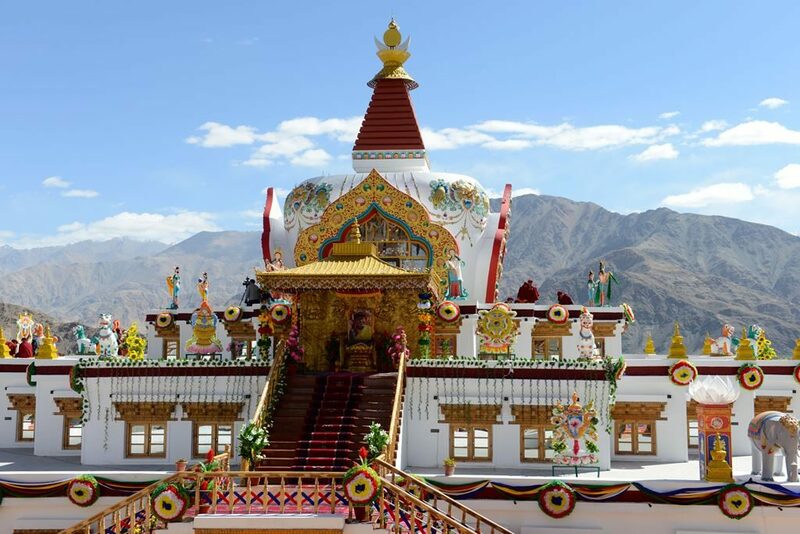 This was not the biggest of the Naropa Festivals, often called the ‘Kumbh of the Himalayas’. 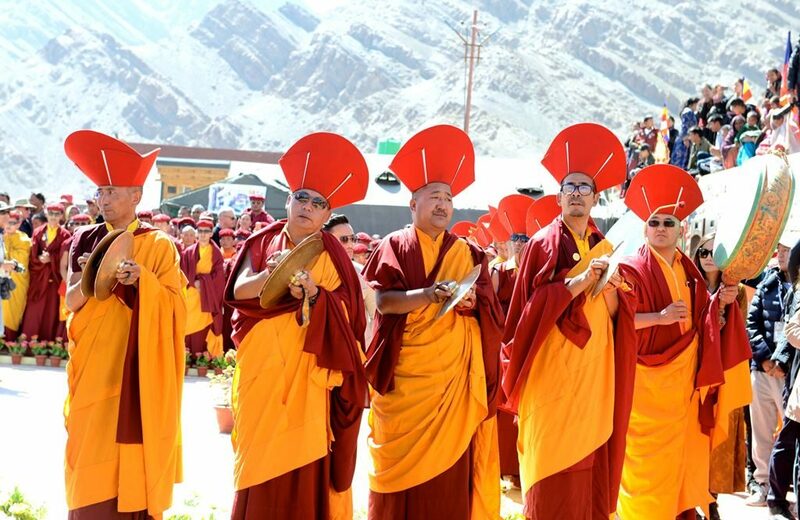 Held every 12 years, the festival is the largest Buddhist congregation in the Himalayas. This September, it broke from the 12-year routine to host a festival two years after the big Naropa. 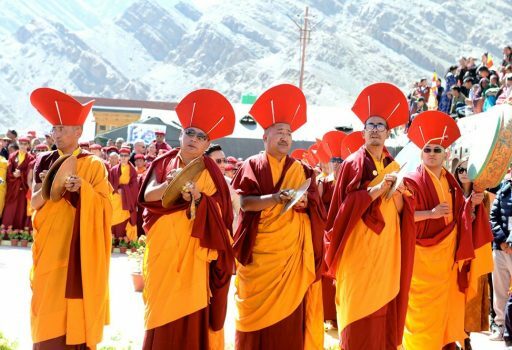 The sorrel landscape was swathed in maroon – the colour of the monks’ robes, its monotony interrupted by the gleam of traditional silver jewellery of the Ladakhi women. Women in perakh (head gear) embedded with turquoise stones, woollen goncha (dress) adorned with long, stringed silver brooches and embroidered yak-leather papu (woollen shoes) were waiting patiently for a glimpse of the Six Bone Ornaments that consist of anklets, bangles, crown, earrings, necklace and seralkha*. Devotees believe that the mere sight of these ornaments would confer blessings so great that the doors to the three lower realms – animal, hungry ghost, and hell – are closed. oboe**, drums, and trumpets. I joined the crowd towards the sanctum where the ornaments were displayed. Entry to the sanctum was restricted and photography strictly prohibited. Stern security men were ushering the crowd, and there was not a moment extra to gaze at the ornaments. I got a glimpse. That is all. There was more to the day. 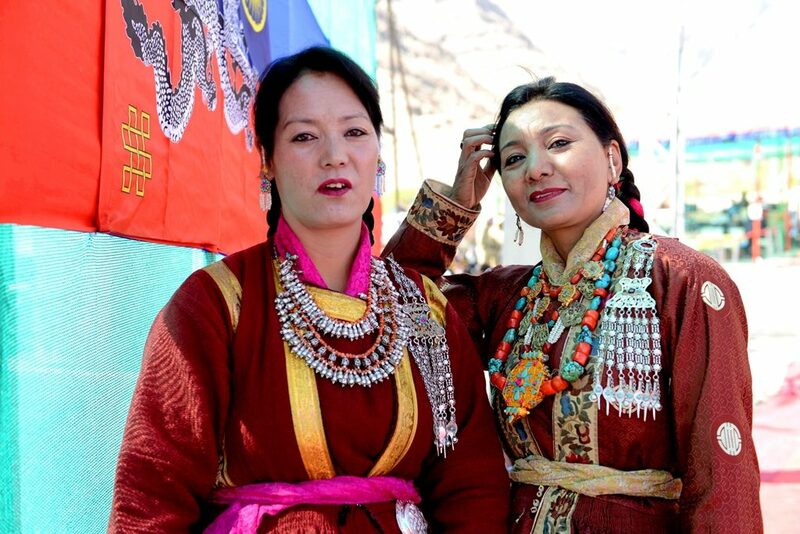 Traditional dances, spiritual discourses, official launch of the Naropa Fellowship, release of Ladakh’s first EDM (electronic dance music) CD and lunch in a large tent with the snow-capped mountains staring at my bowl of rice and vegetables. The shops were laden with local handicraft, and women in intricate jewellery were pouring salted yak-milk tea from gigantic flasks. Another day. Another bumpy ride to the Hemis Monastery to look at the thangka*** of Buddha Amitabha. One of the largest thangkas in the world, the 60-foot silk embroidered brocade of Buddha Amitabha was unfurled on day 2 of the Naropa Festival. Perched on a metal scaffolding, the thangka was open for public viewing between 8 a.m. and noon for four days. His Holiness Gyalwang Drukpa, the 12th reincarnation of Naropa and the current head of the Drukpa lineage, was not present. However, I felt his compassion at the Stray Animal Rescue and Management Centre, which was founded by him. Far away from civilisation, the injured dogs, the horse with a broken leg and the camel with a nasty back have found a home and care. Separate enclosures for nearly 350 dogs and hundreds of poultry, camels, horses, donkeys. All sick and injured and brought to the centre. Compassion has found a home in the cold desert. At the Naropa Festival, I found religion stepping beyond rituals and discourses. I sat at the feet of His Eminence Thuksey Rinpoche to learn about how the Naropa lineage has stepped into the unchartered territory of saving the environment and creating Himalayan leaders. He talked of the tree plantation drive and the initiative to provide garbage bags to taxi drivers so that Leh’s beauty is not tarnished by plastic bottles and littering. 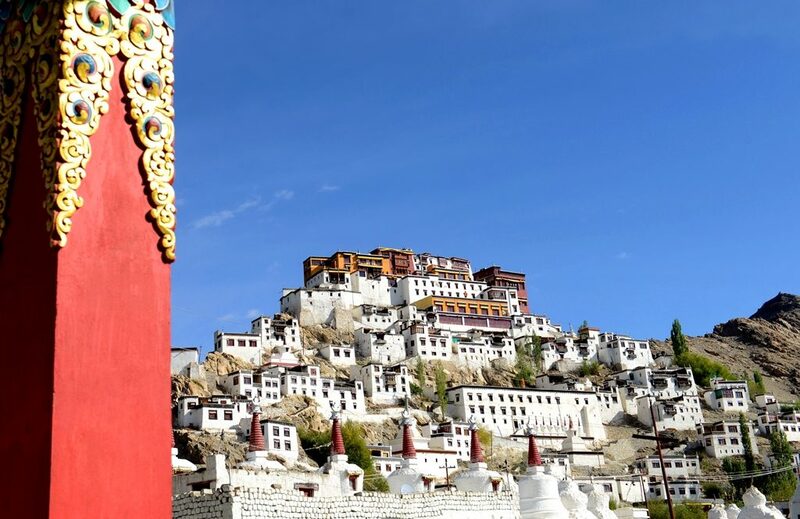 The Live to Love Foundation along with Waterkeeper Alliance and Himalayan Glacier Waterkeeper, founded by His Holiness Gyalwang Drukpa, has launched a first-of-its-kind initiative to protect the waters of the Himalayas. these ornaments would confer blessings so great that the doors to the three lower realms – animal, hungry ghost, and hell – are closed. I do not know whether the dakinis closed the doors to the three lower realms for me. However, at the feet of Thuksey Rinpoche, I learnt that the blessing of the Naropa is manifest in the world.